Print projects from Red Castle, Inc.
Just download RedCastlePrint.exe and when you run the program, you will be able to select which pages or which projects you wish to print. You may select as many pages to print at a time as you wish. To use the program you must be connected to the internet before you start the program. Program runs, and the first thing that the program does when you click on "Continue" is download a news page telling you what is new and any software updates. When you click on "Print Project Pages" the program downloads a list of all the current project pages. 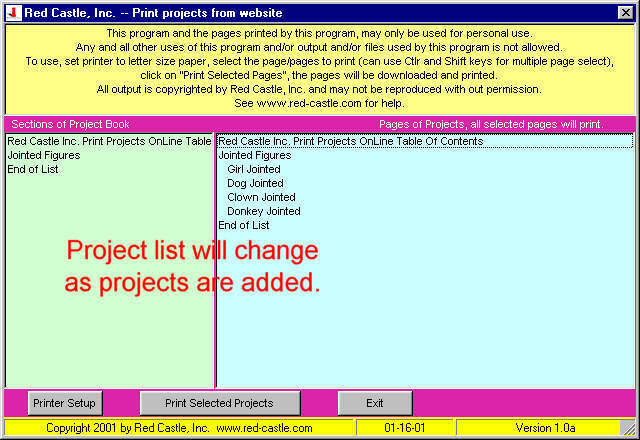 You will then see the screen above with a list of the currently available project pages to print. Select the pages you want to print by holding down the shift key and click on page to select a range, or holding down the Ctrl key and clicking on the pages to print. Press the "Print Selected Pages" button to start the printing. Each page will be downloaded and printed. The pages are about 120KB in size so they download fairly fast. Browse the Red Castle website and place an order for your sheets of stamps to decorate the projects, the more orders placed as a result of customers using this free service the more projects that will be added. Thanks. Download the program first, then when you run the program you can select one or more of these projects to download and print. The list of parts with each of these dolls are the stamps to use to make the dolls that the clothes shown will fit. Click here more information on ordering the JK Doll Kit of 3 sheets of rubber stamps required to use these doll clothes. Click here to see images of the 3 sheets with the letters/numbers identifying the rubber stamps used, and for many examples of dolls made with the JK Doll Kit. The figures here show how they will look after printing, and fastening together. This is just the first six, if the feedback shows that customers enjoy these projects more will be added, so always press refresh on your browser, and return soon. If you want me to send you an email when new project pages are added send an email to phil@red-castle.com with "project list" in the subject.